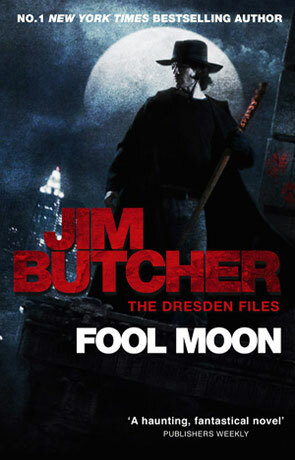 Fool Moon is the second book in the Dresden Files by Jim Butcher and once again we meet up with Chicago's only professional wizard and one of only a dozen of his power in the country. Since we left Harry business has been pretty non-existant and he's been unable to find any kind of work at all mundane or magical. Just when it looks like he can't even afford his next meal a murder comes along that requires his very particular expertise. A full moon, strange paw prints and a mutilated body doesn't take a genius to guess just what they are up against. I really do love this alternative reality urban fantasy that we were introduced to in Jim Butchers first novel Storm Front and we are again immersed into this rich world full of magic and magical creatures. The author again manages to hit the nail on the head here, we've got a great plot, excellent continuity (which I do find important) and even more importantly we get to see the major characters develop and learn a few more snippets regarding Harry's intriguing past. Not content to make this simply a "werewolf" novel, we are actually treated to four different kinds of werewolf each type explained much better than I would have expected. We do treat over familiar ground to a certain extent, for those of short memory or who haven't read the previous novel but this is fairly minimal. There is also an amount of "deus ex machina" going on but the quality of the prose and the world weary dogged determination of the protagonist more than makes up for this. The character of Harry does get filled out quite a bit too and comes across as someone who really does stick to his morals despite times when he's looking death right in the face, can we all say we'd do the same (i'd have signed that contract with Johnny Marcone the first time he offered). The blend of action, gore and dry humour is spot on and there are a serious amount of laugh out loud moments, especially in the second half of the story. I really did like this book, it's one of the few that I really couldn't put down and went with me while I walked to the kitchen to make a cup of tea, unwilling to break off for those simple tasks -the sign of an truly immersive story. In some ways The Dresden Files feels like the definitive "Urban Fantasy" and I occasionally find myself subconsciously comparing the series against other books I read in the genre. There is a certain quality that is much greater than the sum of it's parts, it will be interesting to see if this quality continues or even improves as the series progresses and with a further 11 books (at the time of writing) left to read it's going to take some time to find out. Written on 25th June 2012 by Ant.